From the Front Door to the Street, Everything Matters. In an effort to improve our curb appeal, at our home, we installed this wrought Iron arbor and pair of matching trellis' on each side, shawn in the photo above. Over the years we have had blaze climbing roses andhyacinth bean vine growing over it. 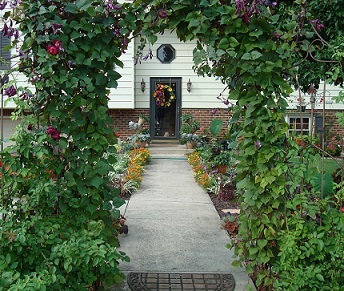 This arbor adds a focal point to the front yard landscaping, and helps to make the long straight walkway more interesting to look at from the street. It definitely improves our homes curb appeal . Add seasonal decorations to your front yard landscaping . 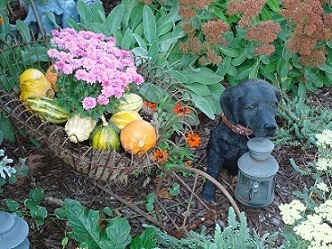 The photo above shows a wrought iron wheelbarrow decorated for fall. Don't be AFRAID to decorate for Halloween during the season. Halloween is the 2nd largest decorating event of the year. If you enjoy Halloween, go ahead and decorate your front yard landscaping The temporary dispruption to your curb appeal with be ok. The same goes for the Christmas holiday season. If you want to decorate outside go ahead and do it! Express YOUR style. Just make sure your remove the decorations immediately after Oct 31st. Or THEN it would look tacky. Get Spooky and Fun Halloween Decorating Ideas here! This photo shows creeping Phlox growing at the wall of our driveway. This perennial is very colorful in the spring. It stays green the rest of the year. 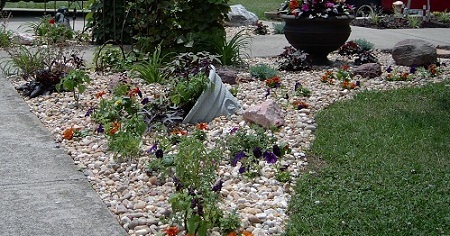 The picture below is my landscaping after we did a makeover in our front yard landscaping to improve our curb appeal. As you enter your driveway, or stroll up your sidewalk, or take walk down your street are you pleased with the appearance of your home? Does your home have the curb appeal you desire? The lawn, landscape and house are the first things everyone sees. Have a friend or family member take a walk with you. They may see something unsightly that you overlook. Does everything please your eye or do you see a few projects that need doing to improve your homes curb appeal? Simple updates to your lawn and facade can really make a difference without costing alot of money. When you smile as you drive up to your home, and you get compliments from friends and neighbors, then you will be happy with your curb appeal. We later added a stone border around all of the landscaping. The picture at the bottom of the page shows another view with the rock border. Notice the buried planter in the landscape. That offers a good opportunity to add a little something different to the area. 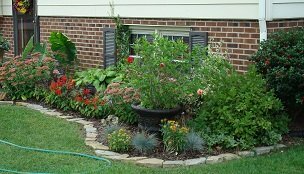 Get more ideas on how to create the front yard landscape you want here! 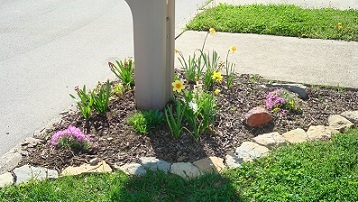 The photo above shows the landscaping we added around our mailbox. This is a spring photo from last year. Now there is something interesting around the "not so interesting looking" mailbox. Eventually it will be a different mailbox. I prefer a more traditional look over a plastic mailbox. Sometimes changes that you make in your front yard, or by simply painting your front door can spark excitement on your street. 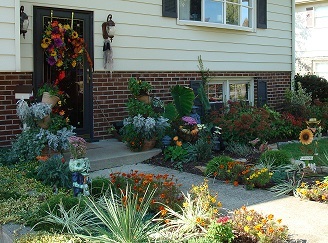 Soon other homeowners will start to make improvements to their curb appeal as well. Before you know it the neighborhood is looking better. And everyone is improving their homes and gardens. That is always good. home improvement projects can and should be spaced out over time so that the work is not so overwhelming or overly tiresome - unless you have a deadline for some special event, or you are moving and need to sell the house. This way you also have time to make changes in your plan as you proceed. If you have alot of repairs to do, break the projects up, do one at a time instead of starting to many and never getting anything finished. The exception to this would be if one project is part of another and they have to be done together. Through out the pages of this website, I will get into that with some examples of some of the improvements we have done to our home over the past few years. 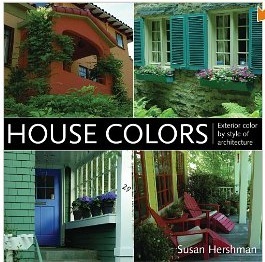 Details about the the book - House Colors is the most comprehensive resource ever compiled on choosing exterior house colors. Sorted by architectural style, this format will allow the reader to pinpoint the colors that will best suit their style of home. It is the ultimate resource for those looking to achieve exceptional color combinations, from subtle to bold, that are so difficult to achieve without professional design assistance. The information included will supply the homeowner with all of the resource information from manufacturers and retailers that are needed to provide dazzling professional results, that will increase the beauty of the home and neighborhood, increase curb appeal and add value to the property while creating pride of ownership for the homeowner. 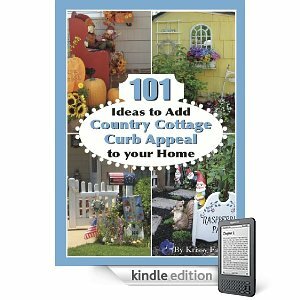 In 101 Ideas to Add Country Cottage Curb Appeal to Your Home, you will find ways to transform your ordinary house - into a storybook home with simple improvements. By adding curb appeal, you will not only be happy coming home, you’ll increase your home’s value. The outside of your home reflects the people who reside there. What do you want your home to say about you? Do you need to sell your home quickly? Increasing your curb appeal will be a big step in the right direction to make home buyers take noticeour your available property. Inside this book you will find: * expert ideas to add country cottage curb appeal to your home * ways to increase your home’s value * solutions for privacy issues and more * draw buyers to your home if you are selling * and much more!